When I was a nine year old, I was bullied and called names by a couple of punks in my neighbourhood. My mother used to say that these unprovoked attacks said more about the small-mindedness, insecurity and stupidity of the attacker than me. She was right, of course. 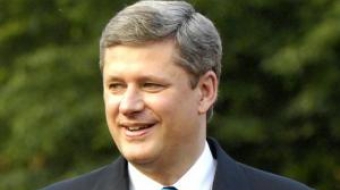 Harper has gained and held on to political power by being just that kind of bully. He bullies his staff, his caucus, and the public service. And he instils fear in Canadians and scratches the ugly underbelly of our insecurities. Contrast that with Michael Ignatieff. He was in West Vancouver last week to attend a town hall at the Kay Meek Centre. Five hundred people showed up to take the measure of the man. By all accounts, they experienced something dramatically at variance to the ridiculous caricature they’ve been spoon fed by the Harper Conservative attack juggernaut, and to an extent, the media they watch and read. Ignatieff has been engaging Canadians in a conversation about the future and the kind of country we want and can be. There are no props, no scripts, no canned talking points, and no set up questions. It is all raw and unplugged. Ignatieff has done this countless times since he was elected to parliament five years ago. He is showing Canadians what he's made of - in spades. Despite the attacks, the criticism, the sniping and arm-chair quarterbacking from all directions, the man perseveres with a resilience and integrity that I can only describe as humbling and inspiring. Is this the behaviour of a man who is “Only in it for himself” as the Harper attacks say? Or five years after being elected to the House of Commons, the conduct of a person who is “Just visiting”? Before first meeting him two years ago, I knew Ignatieff from afar from his dispatches from the Balkans in the New York Times Magazine, or reading his magisterial biography of the preeminent political liberal philosopher of the 20th century, Isaiah Berlin. But what made the most impact on me was Ignatieff’s “Rights Revolution” a profound dissertation on the meaning of nationalism. This thoughtful theoretical framework explained Canadian and Quebec “nationalism” in a much broader global context. The depth of his understanding and insight of Canada’s soul not only impressed me, but blew me away. This is not the work and thought process of a man who is “Just visiting”. A few months ago, Ignatieff was criticized for going to Alberta, because it isn’t exactly a bastion of Liberal political support and for supporting investments in technology to make the oil sands cleaner and more environmentally sustainable. Let’s face it: The easiest thing in the world would be to condemn the oil sands for its environmental performance. There would be votes in Quebec, Ontario and British Columbia for doing just that. After all, what Liberal leader in their right mind would wax poetic about the tar sands in Alberta? One that thinks like a prime minister, that's who. One whose primary motivation is the greater good of the country, that's who. One who steadfastly refuses to pit one region against another for the sake of political expediency, that's who. One who has decided to enter the public realm to build and unite, not divide and conquer, that’s who. Who was the guy who first had the guts to acknowledge the reality of the Quebec nation, and provide the intellectual framework and rationale for it? His name is Michael Ignatieff. Funny that it took a guy who was "Just Visiting" to understand Quebec and Canada so profoundly that it was he who first articulated the philosophical and historical reasoning for the acceptance of the reality of Quebec's status as a nation within Canada. Much like what he's said on the oil sands, his considered view is one grounded in deep insight, courage, integrity, and above all, his coherent view of the national interest, not short term political self-interest. But this is a very different political leader, the likes of which Canada has not seen in decades. And I believe in my bones that we crave for this kind of hopeful, optimistic, decent, and thoughtful leadership from a prime minister. National leadership requires sincerity of purpose, strength of character, finesse, and statesmanship. Michael Ignatieff is several cuts above Stephen Harper in all those respects. Michael Ignatieff has said Liberals can't expect to have the trust of Canadians unless we're willing to earn it back. And earn it we must. He has challenged us to be bold; to be unafraid to identify the problems we must tackle, to be courageous in the solutions we propose. This work is not for those who worry about poll results from one month to the next. It is the work of men and women who have no fear of doing the right thing, but fear doing nothing. It is the work of builders, whose singular, steadfast dedication and paramount motivation is to the national good. That's bred in the bones of Michael Ignatieff. That's why he's here to stay.